Thanks to the hard work of translator María Elena Sánchez Salazar, with the support of the editorial team at the Institute of Geography at the Autonomous National University of Mexico (UNAM), we have the first PKP School course in Spanish — Setting up a Journal in OJS 3. Thanks as well to Raúl Marcó del Pont Lalli and Claudio Amescua of UNAM for supporting this translation. 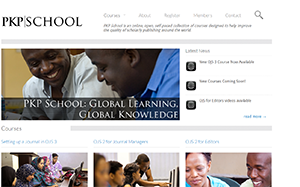 With over 1700 journals in Spanish-speaking countries, this course will help them make the best use of OJS. All PKP School courses are online, free, and self-paced. We hope this is only the first of many course translations to come. 6 Comments on "El primer curso de PKP School en español / The First PKP School Course in Spanish"
Estoy interesado en tomar el curso en español de OJS 3, podrían darme mas detalles a mi correo de favor. ¡Me complace escuchar su interés en el curso! Tendrá que registrarse en el sitio web del curso. Es gratis, en línea y autodidacta. Dear friends, please let me know what to do if I want to take the course. Hi Alejandro! You will need to register on the course website. It is free, online, and self-paced.